Mint Artists Guild grows Detroit area teens into artists and leaders who thrive as creative entrepreneurs and engaged, generous citizens. As we teach creative young people tools of success and engage and pay them for creative projects and services, Mint opens doors to economic empowerment, social change and creative and life changing opportunities. Mint works with artists ages 13 to 19 on entrepreneurial, career and life skills, and gives them opportunities to sell their creative work. 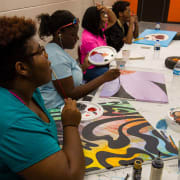 A summer jobs program, business workshops and online educational and informational resources are offered to young visual artists. Would you recommend MINT ARTISTS GUILD? I was lucky enough to earn a job working along side Vickie Elmer and many other creative minds. The atmosphere was very welcoming and very relaxed. I suggest joining the learn and earn as well although I could not join due to some unfortunate circumstances,but This organization will always stay in my heart.